And the flag season is finally over for most. With the exception of the 4 teams who have made Britbowl on September 17th, it’s done. Finished. Or not! Enter the Outlaw Flag League. Born out of the desire ‘for the reps’, the OFL went from being a bunch of guys who celebrated a ‘pick 3’ in training to a fully blown league with 14 teams. 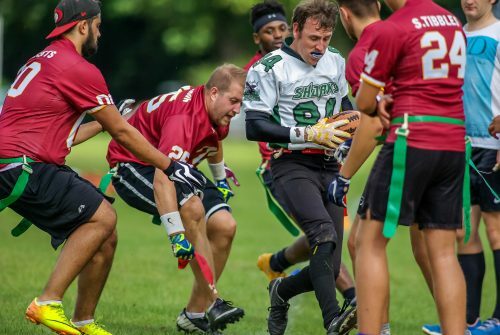 The OFL allows teams to continue playing flag through the autumn and winter months of the year and has provided an opportunity for two franchises who have yet to enter the BAFA leagues to cut their teeth with more experienced sides. As the only PTF writer who was present, you’re all going to be forced to accept my interpretation of events (which is always subject to bribery of course). So you read pick 3 up above and you’re wondering – what the hell? Let me explain. 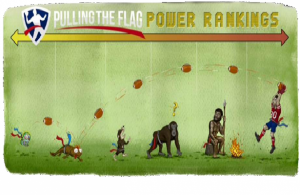 As most of you will be aware, when you score a touchdown, you have the choice to go for 1, or 2 extra points. A 1 gets you a shot from the 5 yard line, and a 2 from the 12. Well, in the OFL you can go for 3! A 3 gives you a shot from the halfway line. As early as Gameweek 1, we saw an attempt for 3 in the Manchester Crows v Staffordshire Surge Academy game. It wasn’t to be, but you can be sure that when it is – the celebrations are going to be crazy! Full of gratitude for the fun you had in the OFL? No doubt your gratitude has gone in the direction of Jordan Melay, who has worked tirelessly to set up the league and have it running smoothly. 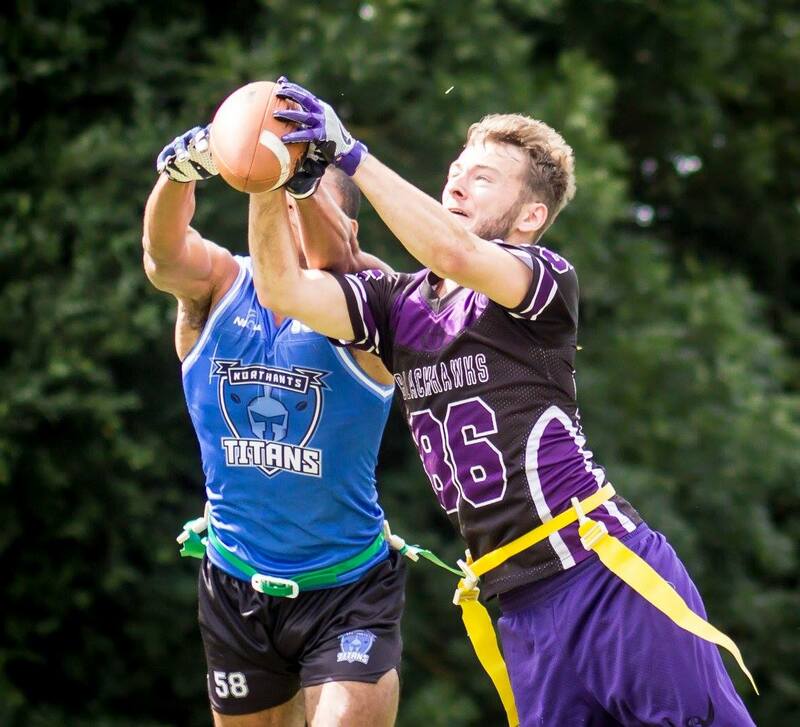 Unfortunately – a man capable of running a 14 team league like Jordan Melay forgot to even put his flag belt on when he made his OFL debut for Northants Titans Atlas against Rainford Brook Raptors. Even the best forget the basics! Staffordshire Surge Academy are probably the youngest team in the OFL (Sorry Coventry Cougars! ), but decided to put some experience under centre when their coach Stuart Beech stepped up to play QB in the game against the Manchester Crows. Receiving the snap, the QB dropped back before unfortunately tripping up and falling over in the endzone to concede a safety. The controversy wasn’t over though. With stats being recorded, Ash Thackery of the Crows almost had a nervous breakdown over the prospect of not being awarded the safety for his blitz pressure but was reassured upon a quick viewing of the stats sheet. To Beech’s credit, he took the safety in great humour. It’s one of those things that probably won’t ever happen again! That wasn’t in the script! New franchise Northants Aztecs looked like they were in for a long day after the Coventry Cougars gave them a rude awakening in their debut game as a team. It didn’t look like it was going to get much better when they were drawn to play longstanding side the Chichester Sharks in their next game. Top scoring QB Neil Henderson (who has played 3000 more games than the entire Aztecs side combined) swiftly took the Sharks to the half time break with a two touchdown lead and it looked like they were going to walk away with a solid win. But several Aztecs interceptions and a much more solid offensive strategy saw them edge ahead and managed to topple the hugely experienced Sharks for their first ever win. Scratch teams can ball out as well! The Cadbury Heath Coyotes came together as a scratch team and finished 2-1 to end up with a winning record. QB’ed by Justin Huxter, the Coyotes were able to field talent like GB star Josh Allen and the aforementioned duo hooked up for 5 TDs on the day alone. The real issue comes with a lack of chemistry and training in between gamedays, but the Coyotes have put themselves in a strong position to push for a playoff spot after their performance in GW1. Leading their conferences with 3-0 perfect records were the Manchester Crows, and the Baker Street Buttonhookers. 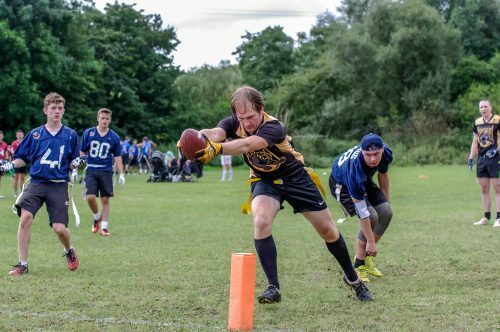 The Manchester Crows obliterated all in their path, with 70+ points being put up against the rookies from Staffordshire Surge Academy for a baptism of fire. Boasting height across the shop, and some big plays on both sides of the ball, the lack of GB player Matt Wilkinson did nothing to harm their performance. 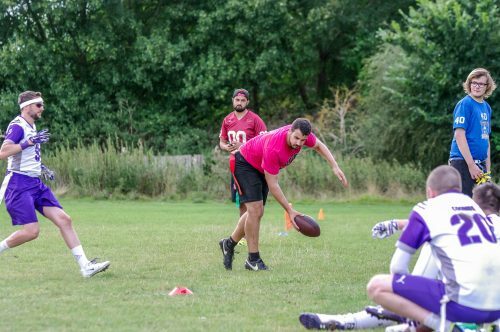 I do NOT have a man crush on Sergio de Paco for the record – who cleaned up with 7 TDs on the day, including a mesmerising run against the Mansfield Honey Badgers where he ran through the entire team. The Baker Street Buttonhookers turned up without QB Vince Machi, but it didn’t seem to make much difference – as they went on to crush all of their opponents. Drew Newiss turned up ‘for the reps’ as well to get some time in the game before he flies out with GB for the World Championships too. 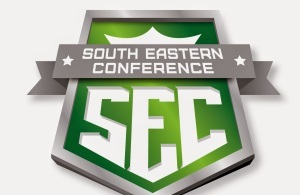 Both sides will have to be very confident of their chances to make the playoffs. Northants Titans Atlas left with a 100% win record too, albeit only going 2-0. No doubt their game with the Manchester Crows in GW 2 will be one to watch! As usual, we were blessed with wonderful photography. James Brewerton of the Cheshire Cavaliers and Rob Connor of the Manchester Crows took time out to take awesome photos of all the games on the day. We thank you as ever! And that’s that for GW1. Now that I know that Sky Sports have pulled out of the television deal, I’ll make a greater effort to cover as many sides as possible in GW2. See you there on September 25th!